Lake Oswegans show up to things, like the 4th of July fireworks on the lake. Here you see families claiming their spots at the Lake Grove Swim Park hours before the sky lights up. “If you plan it, they will come.” Stop by any of the festivals or events that the city or local businesses sponsor, from the Summer Concert Series to the Christmas tree lighting ceremony, and you’ll see that Lake Oswegans want to be involved (and have a good time). Not the case in Lake Oswego. People line up for LO Reads book giveaways, and fill the aisle between the book stacks to hear an author speak or a local musician perform. They claim their fireworks viewing spot at the Lake Grove Swim Park early in the day and then pack the place in that evening to catch the show. They flock to sold out performances of special events like A. Lincoln at the Lakewood Center for the Arts and the inaugural Wine Walk in downtown LO. “If you debate it, they will come.” I recently attended a Development Review Commission hearing on the proposed Block 137 development. It was an overflow audience, with people standing along the walls, sitting on the floor, and listening in the lobby on video monitors. Lake Oswegans are invested in their community and will use whatever venue they can to make their opinions heard from letters to the editor in the Lake Oswego Review to city council and school board meetings to protests on A Avenue. “If you need it, they will come.” Lake Oswego is one of Oregon’s most affluent communities with a median household income of $84,186 in the 2008-2012 U.S. Census, compared to $50,030 for the state. It is also one of the most generous. Consider the nearly $21 million raised since 1986 on behalf of the Lake Oswego School District Foundation to fund more than 300 teachers. Or the equivalent of 44,000 cans (with cash donations factored in) that Lake Oswego High School students collected in a recent food drive. Or the $22, 681 and counting that the Lakeridge community raised last year to help pay for medical care for a teacher’s son who has cerebral palsy. “If you build it, they will come.” The original maxim holds true too. The site of Millennium Plaza Park was once an apartment complex, affording the lucky residents a view of Lakewood Bay. 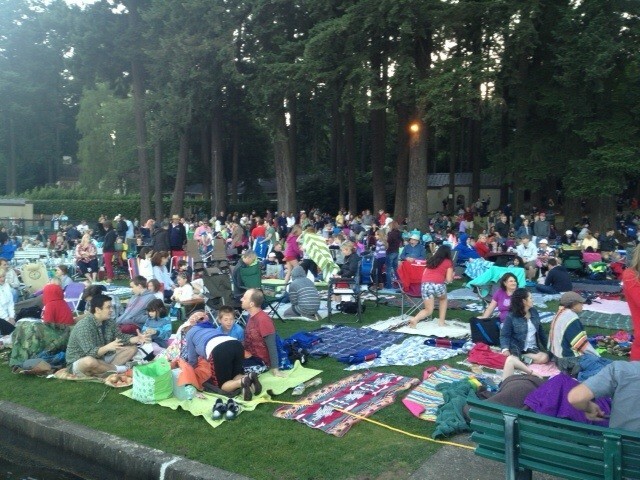 Now all Lake Oswego residents as well as visitors get a chance to take in the sights. During the summer it’s hard to imagine the city’s outdoor living room wasn’t always there because it’s thriving with activity from the Farmer’s Market to Movies in the Park. Same goes for other new additions to the city’s growing list of amenities like Hazelia Field and Dog Park, and the Charlie S. Brown Water Sports Center. Lake Oswego’s special qualities can be attributed to many things like the beautiful lake at its center and excellent school system, but the power that fuels all this is the energy, investment and commitment of the people who live here. Whether you plan it, debate it, need it, or build it, you can count on Lake Oswegans showing up because they care. If you or someone you know would like to become a part of this great community, let me know. I’d love to show you around and give you an idea of what the Lake Oswego housing market is like. 503.939.9801. This entry was posted in Lake Oswego lifestyle. Bookmark the permalink.